Not Humphrey, but pretty awesome anyway. Welcome, Odie! Someone has replaced my spreadsheet-making, ever-cautious fiancé (what a weird word!) with his risk-taking, adventurous doppelganger. First, the engagement and now, a dog! As many of you know, we’ve been trying to adopt a furry friend for about a billion years. We’ve responded to over a dozen Craigslist ads, newspaper listings and kijiji posts – always just a bit too late. Yesterday morning, JF answered a listing from Wasaga Beach. 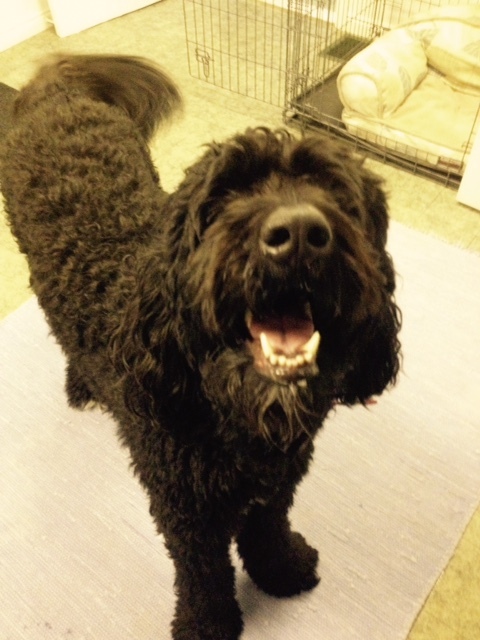 Odie, a one-year-old bernedoodle, needed a home because his mom was downsizing. To our great delight, she answered within minutes. Could we go see him that afternoon? When he came bounding up the stairs – a big, black ball of legs and fur – our eyes opened wide in shock. He was enormous! But he snuggled up to us both immediately, laying his head on my hip for a scratch. After an anxiety-ridden coffee break at Tim Hortons’ (is he TOO big?) we went back to pack his huge crate, bed and dishes into tiny Tobias. He hopped in without hesitation, crouching his head because the roof of the car was too low. When we got home we took him for a walk and pondered the enormity – literally – or our decision. After setting up his things in the mudroom we watched him excitedly wander around our house. All 85 pounds of him. But when we sat down to watch a movie, he cuddled with us and all was well. How lovely to have a giant, happy, sweet and friendly teddy bear! There is a lot of training and hard work ahead. But there are also a thousand hugs, kisses and games of fetch. And I’m so excited. 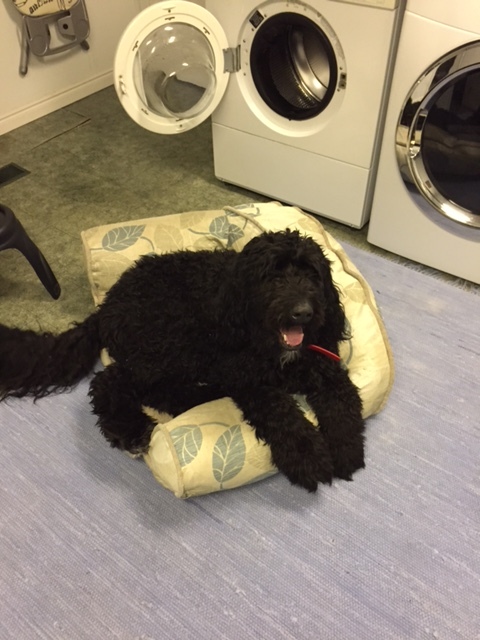 This entry was posted in Love, Family and Friends, Personal growth and tagged adoption, bernedoodle, black, dog, fur, fur baby, odie by Mikaela Lefaive. Bookmark the permalink. 🙂 he looks super happy! Thanks Kiran. And he IS! I love him already.